Indoors on field turf. Three standard classes and 7 games. Special ribbons, special prizes, great swag this year! On a very personal level, this will be the “championship” debut for our young girl Cedar, who (due to age) might have only a couple of local trials under her belt before the Petit Prix. That is not to say she won’t be ready. She’s been getting two-a-day training sessions since she was 8 weeks old. Cedar’s competition will be a field of outstanding agility dogs; handled by some of the best agility gamesmen in our sport. It is time for me to publish a series on the games we will be playing for the benefit of everybody who attends. In the TDAA nearly any conceivable agility game is eligible for competition and titling. Fans of the TDAA are students of a wide variety of games. In the following discussion, I’ve moved the “Strategy” heading to the top of the briefing, rather than burying it down below. Cha-Cha is the invention of Jeff Boyer. The Cha-Cha dance was invented in Cuba sometime in the late 1940’s and early 1950’s. A Latin dance, it is characterized by two slow, rocking steps, followed by three quick steps (the “cha-cha-cha”) danced to a 4/4 beat. The handler must figuratively dance the Cha-Cha with his dog around the “ballroom” (the agility ring). It is true that Cha-Cha is a dog’s choice game. That means that obstacles can be taken in the order and direction of the dog and handler’s choosing. It is not, however, a completely free & loosy goosey point accumulation game like gamblers which rewards the dog for obstacles performed indiscriminately. Cha-Cha requires a very specific tempo of scoring: two slow obstacles, followed by three fast obstacles. Unnumbered courses can be a tough intellectual challenge. Some people aren’t equipped to “make it up as you go along”. Well, that’s the wrong way to look at it. The canny handler will plot a winning strategy, and lay it out as a plan, as surely and specifically as any numbered course. This is fundamental to success in any so-called “dog’s choice” game. Plan your work, and work your plan. This game gets a little complicated on any performance fault by the dog. The rules specify that on any fault the unfinished bar is lost, and the dog must begin again. The objective is for the team to accumulate as many bars of Cha-Cha steps as they can in the time allotted. A Cha-Cha bar consists of any two obstacles other than jumps followed by three jumps. For example, a bar might be a contact obstacle, a tunnel, and then three jumps. Or it might be two tunnel performances followed by three jumps. For each successful bar, the team will earn one point. The game is scored points, then time. Time is for tie-breaking only. Bar jumps may be used as often as desired. Other obstacles may be used only twice for credit. Obstacles other than bar jumps may be taken back-to-back, as long as this is done safely. Bar jumps may not be taken back-to-back. The first obstacle to be taken at the start of any run may not be a contact obstacle. The judge will call “one” for each successful bar (set of 5 obstacles). In the event of a fault, the judge will call “fault,” and the team must begin a new bar. Counting of a bar will begin only once the “slow” steps are started. The dog may begin anywhere along the start line. Time begins when the dog first crosses the Start line. The timer will blow the whistle at the end of point accumulation time, at which point the handler must direct the dog across the finish line or to the finish obstacle to stop the clock. Course design should enable reasonable paths around the ring, with bar jumps liberally sprinkled all over. Transition distances and approach angles should be consistent with venue rules as much as practicable. For safety, contact obstacles should not be placed where they are likely to be taken as the first obstacle in the run. The obstacles should be set to enable multiple likely paths, yet allow the judge the ability to view all of them with minimal difficulty and movement. A Standard course might lend itself well to reuse as a Cha-Cha course. The number and types of obstacles in a FullHouse course might also be a useful guideline. The sample course above tests the random nature of the game. It was based on an existing standard course. 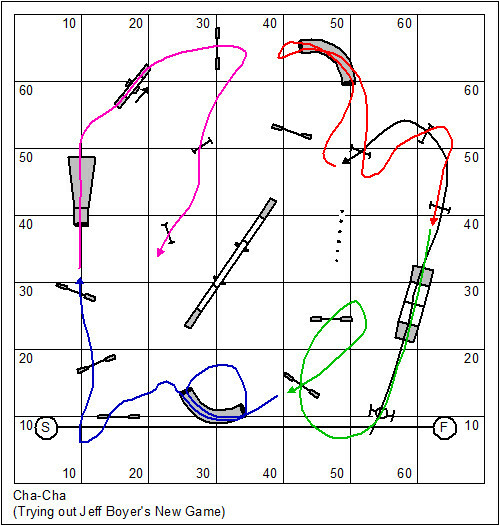 Still I found myself adding jumps to the course to create three jump pinwheels and jump sets so that the jumps weren’t isolated (nothing but trouble under the stated rules. Cha-Cha is a game that requires the dog to earn points to the beat of the Cha-cha: two slow beats (non-jump obstacles) followed by three quick beats (jumps). This is a game of strategy and precision. You are currently browsing the archives for the Cha-Cha category.